What is wrong with America today? The Right wants liberty under the protection of government. The Left wants government control over liberty. The early 20th century saw the rise of socialism in all its ugliness, leading to the Great Depression, two world wars, and thirty years of a cold war that America’s Greatest Generation fought and defeated. Today, monuments to their victories and achievements stand in Normandy where the cemeteries lay, in Berlin where the Wall fell, on the National Mall where the Memorials stand, in our homes and hands where technology rules, and on the Moon where Old Glory flies. Their achievements were the greatest feats in the history of mankind. The 20th century saw the greatest advances in technology from the electric light to aircraft flight, from automobiles to computers. Although socialism had crept into society, patriots did their utmost to stomp it out. They rested on laurels well earned through blood, sweat, and toil to pass on their great prosperity and posterity to their children. Today, their legacy hangs in danger of being swept away by the corruption of their children. Generations raised in wealth have become the spoiled rich kids of the world. The economy that was the envy of the world has fallen to second place. And their children, raised in a society that worshipped God, honored heroes, and learned to work and live the American Dream have turned away from God, disparage heroes, and believe that government should take from those who make money and give to those who won’t work. Americans have become lazy and indolent expecting someone else to do the work of providing for them. Ninety million adults don’t work, but live on welfare in one form or another provided by a corrupt government that has no conscience when it comes to taking from those who work to give to those who vote. The percentage of working Americans has shrunk over the last fifty years because of this. The fatal flaw of socialism is once again revealed that those who strive to make can be victims of a government that takes. In addition, the industries that made America rich and powerful by providing products for the world have been displaced to other countries, not because rich people wanted cheaper labor, but because government taxed them beyond their ability to function and grow. All cheap labor provides is an offset from the cost of shipping overseas. People urged to condemn the rich as greedy feed their own envy making them slaves to their own petty greed. A mistaken belief among the young is that rich men control the world and their children inherit their wealth and power. They may inherit their money, but most never learn how to use it. Where their fathers grew up with a strong work ethic, their children grew up without having to struggle and fail to learn that wealth requires hard work. The wealth they inherit is often squandered, and the businesses their fathers built often collapse to be replaced or bought out by the next driven entrepreneur. 21st century America is not the world of the Robber Barons of the 19th century where people work for starvation wages while they live as kings. Even the poorest American lives like kings in third world countries. This is why the subjects of dictators yearn for America. But many come without declaring themselves, just as squatters would occupy land to steal from the owners without paying for it. Why do petty American children believe that those who create great wealth do not deserve the fruits of their labor? Because they have been taught that capitalism does not breed wealth, but greed, and in their own greed they condemn those who have acquired wealth as thieves. “Money is the root of all evil,” they are falsely told, rather than that “the love of money (greed) is the root of all evil” and greed knows no economic class. America, they say, has become an “oligarchy” of rich people ruling the masses. They fail to understand that those who are the greatest entrepreneurs are those who should be running the country. Those who lead people to greater production are best suited to lead. Instead, greedy people vote for greedy lawyers who produce nothing but excel at taking from those who do. 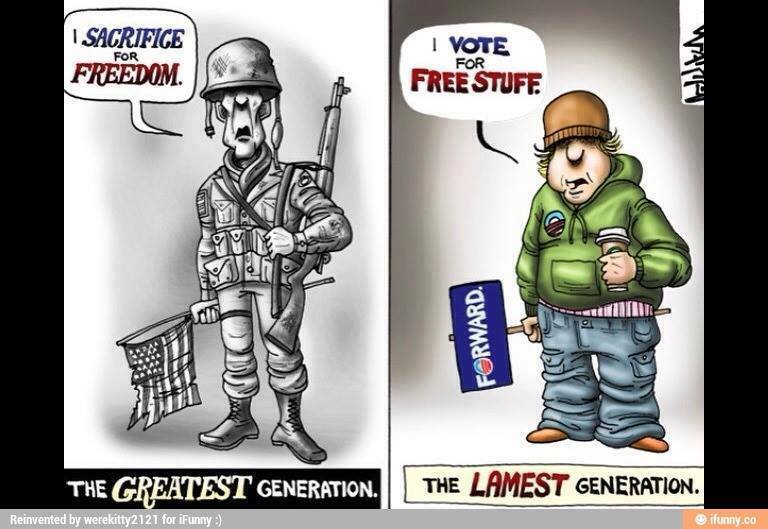 The dysfunctional thinking of the Hippie Generation has translated into faith in the ideology of socialism as being “fair.” They believe that the ideology that their fathers fought against for its evil has somehow become righteous and is to be embraced. Believing every word of leftist propaganda, they have become the generation of fools who think the liberty and capitalism that made America great, the trade and prosperity America has spread around the world, is bad. Somehow they believe that rich people stole that wealth from the poor, rather than understanding that leaders of industry created jobs by which the poor in America prospered mightily. They understand nothing about Republicans fighting slavery, greed, and monopolies in the 19th century. They think Democrats stealing from the rich in the 20th century to give to the poor is better despite most of that wealth disappearing into the pockets of politicians. They believe government should rule the people rather than protect them. An intelligent and moral people do not need government rules to protect them from themselves. The American Dream has never been about acquiring great wealth and living in luxury. Allowing leftists to teach our children all the wrong values and all the wrong history has brought America down from its high pedestal and delivered it into the hands of our enemies. Those children now elect people who want to eradicate the land of their fathers, and incite the peoples of America, not to unite, but to divide and war over race, religion, and ideology. 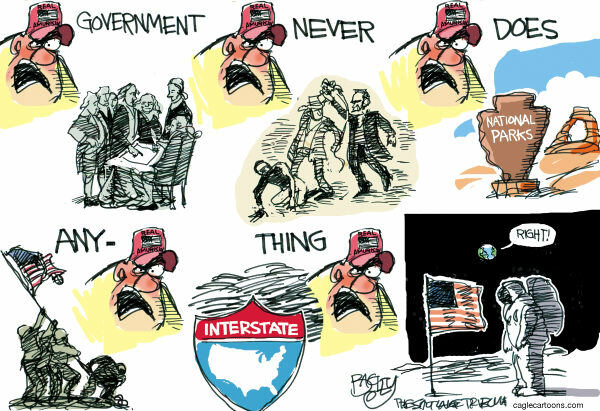 As seen here in this parody of the Right condemning government (when they actually condemn bureaucracies controlling the people), all of America’s greatest accomplishments were achieved through Republican leadership. The exceptions here – WWII and going to the Moon, both of which were done under Democrat presidents – were not achieved by bureaucrats, but by the military. (The military is not a bureaucracy, but a servant, and inhabited chiefly by Republicans. It was Eisenhower, MacArthur, Nimitz, and Marshall who led America to victory, and Winston Churchill who guided FDR. JFK was the only Democrat in history to lower taxes, and he advanced NASA to go to the Moon, but it was Eisenhower who began the space program with that intention. Kennedy was assassinated for his stand against the Left by a communist. Thus was born the new, radical far left Democrat Party of today. As Gruber proved, liberals are easy to fool yielding the Obamabots who follow blindly without question.) And like so many accomplishments fostered by conservatives that have made America great, Democrats like Johnson took credit for Civil Rights legislation that was enacted by Republicans with a few supporting Democrats who had congressional majorities. This entry was posted in Conservatism vs. Liberalism and tagged America, Amnesty, Barack Obama, Climate change, Conservatism, Democrat, Economy, Entitlements, Global Warming, Illegal Immigration, Jobs, Liberalism, Military, Republican, Right vs. Left, Taxes. Bookmark the permalink.